This recipe pretty much speaks for itself. All you have to do is to look at the pictures of this Overnight Slow Cooker Hot Chocolate Oatmeal and it’s almost guaranteed to cause you to salivate. Especially if you love chocolate as much as we do. And hot chocolate? Well…when you put hot chocolate into a recipe name, you know it’s going to be a recipe worth making again and again. Overnight oatmeal is all the rage, and it should be. It’s a healthy breakfast option that can be made in about a gazillion different ways, offering up flavor choice after flavor choice. And when we’re talking about breakfast recipes that are heart healthy–well, you know that’s a winner in our book. Because who wouldn’t want to eat something that is good for their heart? Overnight oatmeal quickly comes to mind when thinking about stress-free breakfast recipes. We’re talking easy breakfast recipes that you know are going to be delicious, ready on time, and made with no hassle in the morning. Which is just about the perfect thing when you’re in a rush to the office or school in the morning. Ready to make this yummy Overnight Hot Chocolate Oatmeal? Get our your favorite slow cooker and lets get cooking! Using steel cut oatmeal is not only a healthier oatmeal choice, but it will ensure the perfect texture of overnight oatmeal. Trust us, it is worth it! In fact, we can pretty much guarantee that once you start eating steel cut oatmeal, you’ll likely not want to go back. Mix the milk, vanilla, salt, and oats into the slow cooker. Stir and let it cook for 6 hours. Pour the cocoa powder and maple syrup into the mix. Stir and let it cook for 1 hour. Set the slow cooker to warm. 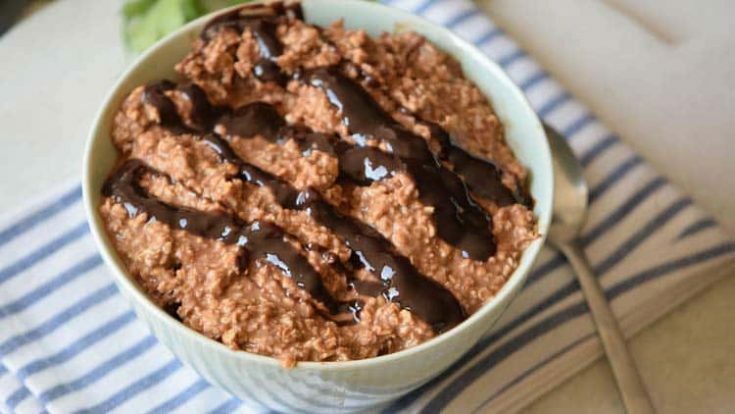 Drizzle chocolate syrup over the oatmeal, serve and enjoy. Tips: Top with some chocolate chips for extra sweetness.